The Amity Foundation has been founded by Dr. Ashok K. Chauhan. It has nurtured and financed a number of principal institutions all over India, with over 80 thousand students based across 700 acres of campuses. In Gurgaon itself, Amity has 3 different School branches. To choose among them is the most difficult task, reason being, all three of them are within 5 kilometer radius and incidentally falling almost on a straight line geographically (see map below). While two of the schools are established with a well-accepted curriculum the third one has brought in the new age curriculum to the forefront. The Amity Schools have some diversity on the form of school, performance, campus size and fees, yet all of them are under the Amity umbrella which is an established brand name in the education arena. Some of the important criteria and points that parents must consider to be able to contend one of the three Amity Schools in the same location are listed below. Amity International School Gurgaon Sector 43 is easily accessible from localities near the Huda Metro Station extending to DLF Phase 1 & 4. Amity International School Gurgaon Sector 46 & Amity Global School Gurgaon are most advantageous for areas in and around Nirvana Country and Mayfield Gardens and within reach of Sohna Road and Golf Course Extension road. All the schools are on one side of the MG road just 5 kilometers apart, so distance may not be a big factor, unless you’re on the other side of MG road, in which case you may want to rule out Amity International School Gurgaon Sector 46 and Amity Global School Gurgaon. The parents do get confused with the term International when the talk is about AIS Sector 43 and AIS Sector 46. Actually Amity has adopted a different terminology by linking the term International with national curriculum and introducing global for international curriculum. Like all the other Amity International Schools, Amity International School Gurgaon Sector 43 and 46 both pursue CBSE syllabus and Amity Global School Gurgaon follows IGCSE and IB DP. AGS Gurgaon now also incorporates the Cambridge University program for classes VI to X and the International Baccalaureate program for the classes XI & XII. Amity International School Gurgaon sector 43 and 46 also show bit of internationalism by way of student exchange programs to Switzerland and Germany and by offering French as a language option. Amity Global School Gurgaon and Amity International School Gurgaon Sector 43 both offer integrated curriculum encompassing classes pre-Nursery to class XII. These schools give admissions from Pre-Nursery at 3+ age, while Amity International School Gurgaon sector 46 starts from class 1 at 5+ age with optional pre-school Amiown at a separate location. But, Amity at sector 46 also offers an integration of a different kind at the senior level, i.e., in competitive exam preparation integrated with the CBSE curriculum. It is the syncro study program where the children of class XI & XII study for the board exams while preparation for Engineering and Medical entrance takes place simultaneously. Amity International School Gurgaon Sector 46 is a day school while the one in Sector 43 is a day school with optional day boarding facility. Amity Global School, Gurgaon is an extended day school. Primarily all three schools fall in the day school category with limited add-ons. Parents who are residing as nucleus families and are away for work from the home may find some solace in the day boarding facility of AIS Sector 43. Amity International School Gurgaon sector 43, 4th in the Amity chain of schools, made its mark with the first batch that appeared in the 10th board exam in 2005. The results were excellent. The school got 100% result. 22 out of 34 students in the batch achieved distinction. The school topper that year got 91.60%. Amity International School Gurgaon Sector 46, 6th in the chain of Amity schools, has achieved and won many awards, competitions and championships. The school won accolades in developing apps and games in the event organized by Kendriya Vidyalaya Sangathan in collaboration with CBSE in Aug 2014. It got the 5th computer literacy excellence award by ministry of communication & IT in recognition of distinguished performance in imparting computer education in Haryana. Amity Global School, Gurgaon received its first batch in August 2008. Though AGS has not appeared in the Education World rankings yet, AIS sector 46 despite a later start has edged past AIS Sector 43 ranking 9th, three places ahead of AIS Sector 43 that ranked at 12th in the Gurgaon region in 2014. Amity International School in sectors 43 & 46 have fairly large campuses while the campus of Amity Global School is comparatively the smallest among the three of them. Amity Schools in sector 46 and Sector 43 have large playing grounds, while the one in sector 43 also has a swimming pool. If one has a look at the fee structures of schools with CBSE curriculum and compares it with the ones with the International curriculum he is going to find a stark difference. Amity Global School Gurgaon with the imported curriculum is no exception and is the most taxing on the pocket among the three Amity schools in Gurgaon. 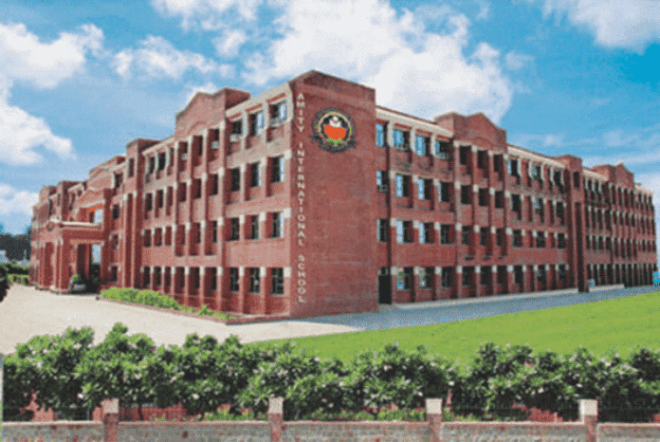 Amity International School Gurgaon, Sector 43 and 46 offer a large campus with good infrastructure and established system following the CBSE route most suited for traditional career paths; Amity Global School Gurgaon follows the new-age curriculum with focus on flexibility and internationalism. It totally depends on the parents to choose the school among these three for their child based on what is right for them.